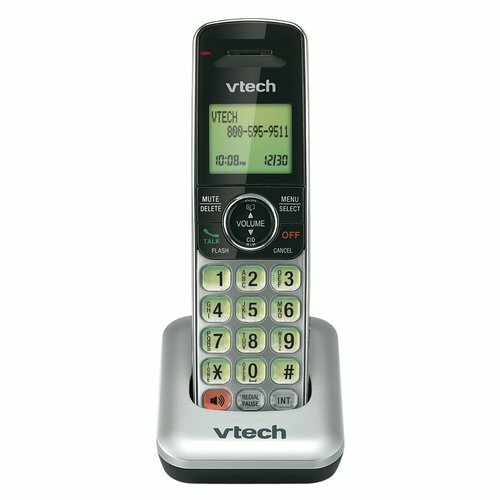 The VTech CS6409 Accessory Cordless Handset will help you monitor your calls with 50 number caller ID and caller waiting so you'll know in advance who is calling. With the convenient voicemail waiting indicator you’ll know when you have messages, and with 14 minutes of answering system recording time you can listen to your missed calls - even from your cordless handset. Quickly find and connect with missed calls with last-ten number redial. The convenient speakerphone feature keeps your hands free to jot down phone numbers or notes while eliminating the need to cradle your phone between your shoulder and your ear. Quickly find and connect with missed calls with last-ten number redial. With full hearing aid compatibility never again struggle to hear your loved ones on the other line. Comes with a convenient wall mount to help clean up desk clutter.